Boroughmuir Blaze were the victims of a remarkable Kings comeback in October, and the parallels were uncanny at St Columba’s High on Saturday. The play-off holders trailed Reign by two points with 14 seconds remaining, but Kantorski was fouled while attempting a three-pointer and converted all three free-throws to put Kings in front. They still had to defend Dunfermline’s final play, but Ali Mackay drew another foul and scored from the line to give the visitors a 77-75 victory (it was 76-75 in October). “You can never write us off!” beamed head coach Craig Nicol. Mackay totalled 15 points and Kantorski 30 as the Fifers tasted only their third defeat this season, and all roads now lead to Oriam on March 30 when Kings will meet Cup winners Falkirk Fury in the final. Sunday’s women’s semis produced double disappointment for City of Edinburgh Kool Kats and holders Edinburgh University, who had hoped to set up a repeat of January’s all-Edinburgh Scottish Cup Final. 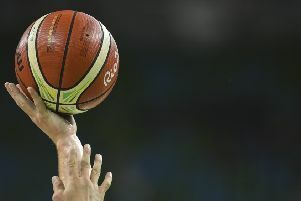 Kats faced their successors as league champions Lady Rocks in Cumbernauld, but a third-quarter surge saw Kats lead 43-41 with ten minutes to go. Overtime beckoned at 53-53 with only eight seconds left, but a last-gasp Rocks three-pointer broke Kats hearts, although they still have the Cup to show for their efforts this season. Edinburgh University’s defence of the play-off title appeared to be over when they fell 24 points behind at St Mirren. A fightback cut the deficit to six, but there was no fairytale finish as Saints clung on to win 73-64. Dori Lansbach top-scored for the students with 22, while 15-year-old Rose Harvey landed a trio of three-pointers during that frantic final quarter. “We got into a hole and couldn’t quite climb out of it, but credit to St Mirren, they were excellent and hit big shots at key moments,” said University coach Donnie MacDonald. 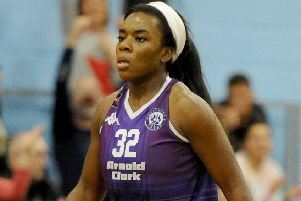 Following a two-week break, Caledonia Pride’s wretched run continued as the Edinburgh pro outfit suffered its ninth loss in ten games in 2019. WBBL Cup winners Sheffield Hatters were short-priced favourites on their own court and cruised home 93-62, although Pride at least matched them in the second quarter. A promising debut from 15-year-old Eabha Kerr was another ray of light for Pride, but this weekend’s trip to bottom club Essex Rebels has become a must-win game if they are to reach the play-offs.